Basic electricity for boat builders, boat repairers and owners. What you need to know about the electrical systems on your boat. Batteries and Chargers. Almost all recreational boats use a 12 Volt DC system, and to supply the power for it they use 12 volt batteries. But there are different types of batteries, that come in different sizes and capacities, and have different inside construction. How does one know which batteries to use, when they all look pretty much the same on the outside? So first let’s cover the basics on batteries. I am only going to discuss 12V DC. There are other systems such as 48V and systems that use both 12V DC and 120V AC. But to simplify this I will stick to 12V, since most boats have 12V DC systems. The simplest have a single 12V battery for starting the engine, running instruments, lights, and a few electronic gadgets such as GPS or depth sounders. The next step up from this is a boat that has a starting battery and then a second battery for running electrical equipment. In particular, bass boats usually have a separate battery to power the trolling motor. Then there are larger boats with all kinds of electronic equipment, beyond the basic stuff, such as GPS or depth sounders. These boats can be equipped with computers, TVs, VCR’s, sound systems, microwave ovens, radars, and so on. These boats generally have a starting battery for each engine and a bank of batteries running all the other equipment. They may have a generator, a charger, an inverter (DC to AC), and converter (AC to DC). They will also have an AC electrical system for AC equipment. There are three types of 12V batteries that are commonly used; Lead-Acid wet cell, AGM, and Gel Cell. The wet cell is the lead-acid battery that we all are familiar with because we have them in our car. It is called a wet cell because it contains a liquid, a dilute acid, that acts as an electrolyte to transfer electrons to the plates. As the battery is discharged and recharged the liquid level goes down, and occasionally distilled water has to be added to keep the liquid at the correct level. When charging, it is best to open the caps on the top of each cell so that any pressure build up is relieved. These batteries give off hydrogen gas while charging so they must be in a well ventilated place. The photo immediately below shows wet cells. Gel Cell batteriesGel Cell batteries, like AGM are SVR batteries. However, the electrolyte is not a liquid; it is a jelly like substance. 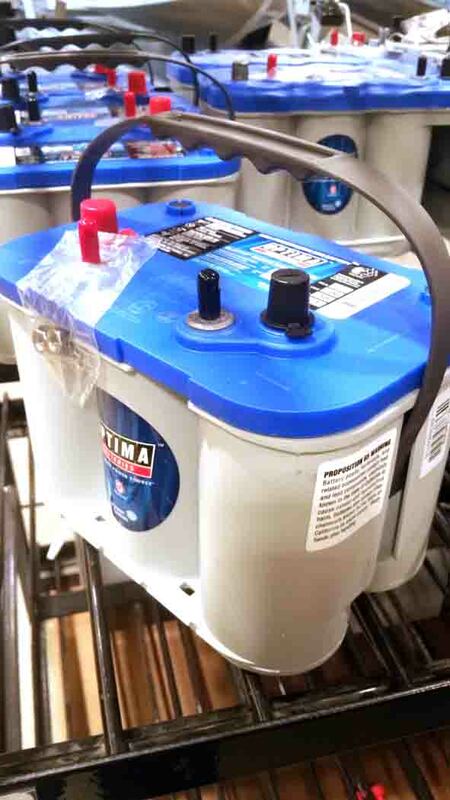 These batteries are sealed and do not require adding liquid after many discharges and recharges. However, like the AGM batteries, they are sensitive to charging voltage and, if over charged and over heated, will out gas and lose some of their life. In addition to these three types, batteries are also classified as starting, or SLI (starting, lighting and ignition), deep cycle, and combination starting/deep cycle. Starting batteries are used primarily for starting the engine and powering the ignition and lights. This requires a battery that can release a large current (amperes, or amps) very rapidly, on larger engines upwards of 1000 amps. Starters require a lot of amperage because of the heavy load trying to turn over an engine. To achieve this, starting batteries are built with many thin plates. The plates are made of a spongy like material composed primarily of lead. They are capable of being rapidly discharged and recharged. However, this also means that the voltage from the batteries will quickly drop to a level that is too low, causing overheating of the starter and, if also used to power electronic equipment, problems with the operation of the equipment. Deep Cycle batteries on the other hand, are designed to release energy slower. They have much thicker plates. True deep cycle battery plates are solid lead. They can be upwards of ¼ inch thick but generally range from .07 inch to .11 inch. Golf cart batteries and fork lift batteries are true deep cycle batteries. They do not release as high an amperage as a starting battery but will maintain the voltage level for a much longer period, so they are used on boats, and other recreational vehicles, as “house” batteries to run all of the electronic equipment and appliances. They also require charging at a slower rate than starter batteries. The draw back is that many of the golf cart type batteries are six volt so you have to buy twice as many. However, there are true deep cycle batteries available in 12V. On an occasional basis deep cycle batteries can be used as a starting battery but may not turn over the engine as fast as a starting battery. Then there are combination batteries that have both thick and thin plates and are used for both functions. These are often sold as “marine” batteries. 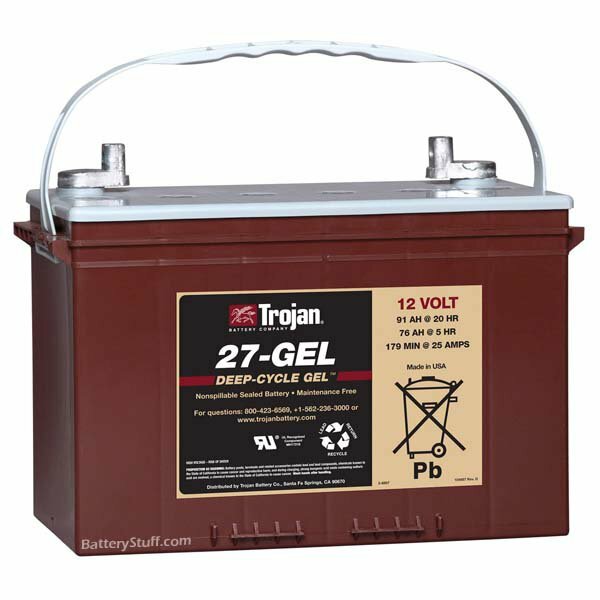 Most RV/Marine “deep cycle” batteries fall in this category. They are perfectly adequate for the use they are put to and will last for many years with proper maintenance. All batteries are rated by cold cranking performance, also known as cold cranking amps or CCA. This is a measure of how many amps the battery can deliver for 30 seconds and maintain the voltage at 12V at -18ºC (OºF). Basically the higher the CCA rating the longer the battery will maintain its voltage. Another way of rating batteries is marine cranking performance, also known as marine cranking amps or MCA. This is a measure of how many amps the battery can deliver for 30 seconds at 0ºC (32ºF) and not drop below 7.2V while delivering 700 amps. Basically the higher the MCA rating the better your battery will crank over your engine even while severely discharged. Batteries are also rated by amp-hours. 1 amp for 1 hour is 1 amp-hr. Generally the rating is based on how many amps the battery will discharge for 20 hours until the charge drops to 10.5 volts. The higher the amp hour rating the longer the battery will power your equipment. Beware, some battery manufacturers rate them at 100 hours and some at 8 hours. If they produce a data sheet for the battery it should give you the 20 hr rate. Batteries are also classed by Group. Most common are Group 24 and 27. It is a common misconception that this has something to do with the capacity of the battery. This is a myth. The Group number is solely based on the outside physical dimensions of the battery, and the type of battery terminals it has, that is, top mounted or side mounted. For instance a Group 24 battery is 10 ¼ inches by 6 13/16 inches by 8 7/8 inches. A Group 27 battery is 12 1/6 inches by 6 13/16 by 8 7/8 inches. This battery is a Group 24. Some people say that a battery that is larger will last longer, because there are more plates in the larger battery. For instance a group 31 battery is larger than a group 24 battery. However, I have researched this and the consensus is that it will last a short while longer, but not significantly longer. Anywhere from a few minutes to 30 minutes at best. The best way to increase battery capacity is to add batteries in parallell. There is a lot more information available about batteries on the web. Go to Ike's list for electrical, and scroll down to the Electrical links. You will find many references there to batteries. Of course if you have batteries, you need a way to charge them. The typically automotive charger is what is known as bulk rate. It pumps current into the battery at a constant rate. If it is rated at ten amps then it constantly charges at ten amps. This is not really good for a battery because you need to keep track of what is going on and not allow the battery to overcharge. But they can be used to give the battery a quick boost. They should not be used for long term charging and maintenance. Most chargers sold today are smart, or regulated chargers. They have a small computer built in that senses the charge state of the battery and as the battery reaches full charge, reduces the amperage to avoid over charging, over heating and destroying the battery. When the battery reaches full charge the charger stops charging. They are often called three stage chargers because they use three stages to charge; bulk, absorption and float. Bulk: used when the battery is deeply discharged and can accept recharge at the highest rate. Different batteries have different acceptance rates based on the design of the battery. What this means simply is that some batteries can be charged faster than other batteries. For instance AGM batteries can be charged faster than wet cells. Smart chargers have different settings for starting batteries, deep cycle batteries, AGM and Gel cells. Absorption: voltage stays constant and the current slowly tapers off. Float: used after the battery has reached full charge to maintain the battery. This used to be called trickle charge but unlike trickle charge, does not maintain a constant voltage and current from the charger to the battery. The charger senses the battery state and applies current when it is needed to maintain the state of the battery. Equalization: Some smart chargers have a level called equalization. The charger senses the charge level of each cell in the battery and brings each cell in the battery to the same charge level. Equalization is usually performed before the float stage. The more sophisticated of these chargers can tell you the state of the battery, if you have shorted plates (plates touching each other), or if the battery is no longer any good. Some also have a temperature sensor that you can hook to the battery. This type is a must when charging AGM or Gel Cell batteries so that they do not overheat and ruin the battery. When charging Gel Cell and AGM batteries the charger also needs to be voltage regulated and temperature regulated. That is, you can set the voltage range so that it does not rise too high or go too low and the charger senses the internal temperature of the battery so it does not get too hot. The voltage range of the battery varies from brand to brand and battery type. Charging at too high a voltage can shorten the life of the battery. Smart chargers can be set for the type of battery so the voltage does not get too high or too low. Many of the chargers set the voltage automatically. It is always best to use the charger that is recommended by the battery manufacturer. For boats or RVs that have 120V AC systems as well as 12V DC, a good option is a converter/charger. A converter changes 120V AC to 12 V DC to run all of your DC equipment without using up your batteries. A converter/charger has a built in battery charger that senses the level of charge on the batteries and automatically re-charges them. The converter can be run off of shore power or off a generator. But, if you have AGM or Gel Cells you must know if the charger is voltage and temperature regulated. Also, if you have AC equipment but no generator or shore power, a device called an inverter can take the 12 V DC from your batteries and make it into 120 V AC to run your TV or computer. However, this will drain your batteries very rapidly so you need a larger battery bank to use an inverter on a regular basis. How about charging amps? How many charging amps should you have, 10, 20, 40? Well, the larger the CCA of the battery then the larger the amperage of the charger should be. Also, it depends on how many batteries you have. If you are charging a single battery you do not need as many amps as if you are charging a bank of two or three batteries. A 10 amp or 20 amp charger is adequate to recharge a single starting battery, but a 40 amp charger is much better for charging a pair of deep cycle batteries. However, for both Gel Cell and AGM batteries it is critical that the charger be voltage regulated and temperature sensing, to get the maximum life out of the battery. A critical issue is acceptance rate. For Lead Acid batteries the charging rate, that is the amount of amperage the battery can accept, is about one fifth of the Amp Hour rating. So if you have a 100 Amp Hour lead acid battery the charge rate for this battery would be about 20 amps. But, for Gel Cells and AGMs the charge rate is much higher, meaning you can charge the battery much faster. But to do this you need a charger or alternator that puts out much higher amperage than for a lead acid battery. But the danger is that if you exceed the charge rate for the AGM or Gel battery the electrolyte will boil, creating bubbles, which are captured in the liquid and never leave. Eventually, if the battery is consistently over charged, it will ruin the battery. So having a charger design for AGM or Gel batteries is critical to maintain them for their designed life. Follow the battery manufacturer's instructions to the letter when using AGM or Gel batteries. Last but far from least: for safety’s sake, on a boat a charger, or converter/charger must be “marine” and ignition protected. Look for a UL marine listing or a statement that it meets USCG regulations, or 33 CFR 183.410. This means it is ignition protected and will not ignite any gasoline fumes that may be present. So what about Lithium batteries? Lithium battery technology for the marine environment (as of June 2014) is still in the stage of development. There are boats, mostly large expensive boats, that use Lithium batteries. The batteries themselves are extremely expensive. But you cannot think of Lithium batteries without thinking "system". These systems are designed specifically for these boats. You cannot just drop a Lithium battery into your boat in place of Lead-Acid, AGM or Gel batteries. The charging and management systems for these batteries need to be designed from the ground up to be safe. There are various types of Lithium batteries based on their chemical composition. Lithium batteries have a tendency to overheat and go into thermal runaway, causing a fire. The best Lithium batteries to use on boats are LiFePO4 (Lithium Iron Phosphate) batteries. They have the least tendency among Lithium batteries to go into thermal runaway. Also, Lithium batteries must have a Battery Management System (BMS) either built into the battery or attached to it, that controls the voltage and all the other functions of the battery. The charging system must also be designed specifically for Lithium batteries. Lithium batteries have many advantages. They are much lighter and deliver more power per pound than conventional batteries. When installed correctly with a BMS and a charging system designed for Lithium, they live three to four times as long as conventional batteries. But, to be safe a Lithium installation needs to be correctly designed and installed. So I would not advise a beginning boat builder to even consider Lithium batteries without advice and assistance from an expert on designing Lithium power systems as part of your boat design team. Here are some good links on batteries.